ColecoVision.dk Homebrew Section Presents: Neal Danner. Neal Danner was a programmer for one of the first Emulator for our ColecoVision System, namely ColEm. ColEm / The Virtual ColecoVision. The ColEm is a project was started by Neal Danner back in October 1994. Neal was the man for The Z80 CPU emulation, hand Controller Emulation, and the SN76489 sound emulation. The graphical part was based on Marat Fayzullin's TMS99XXA emulation source which is included with this ColEm. 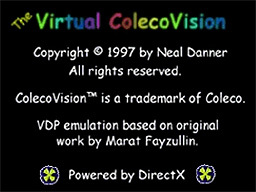 The first name of the Emulator was ColEm, but in 1997 was it renamed to: The Virtual ColecoVision. The Virtual ColecoVision are not updated for Vista, Windows 7 or 8. To get in touch with Neal Danner, try this: e-mail.